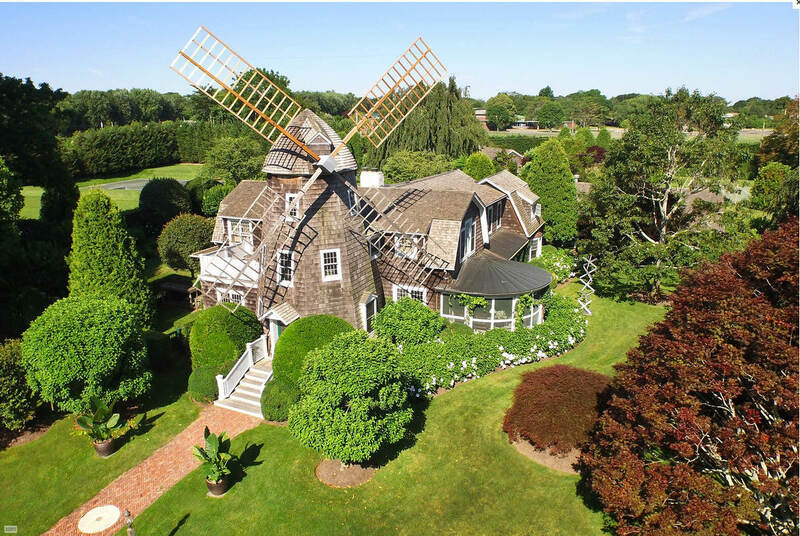 East Hampton windmills became the motif for this historic Victorian house. During the years we had rental houses in East Hampton I wasn’t aware of the Edward DeRose Windmill Cottage. 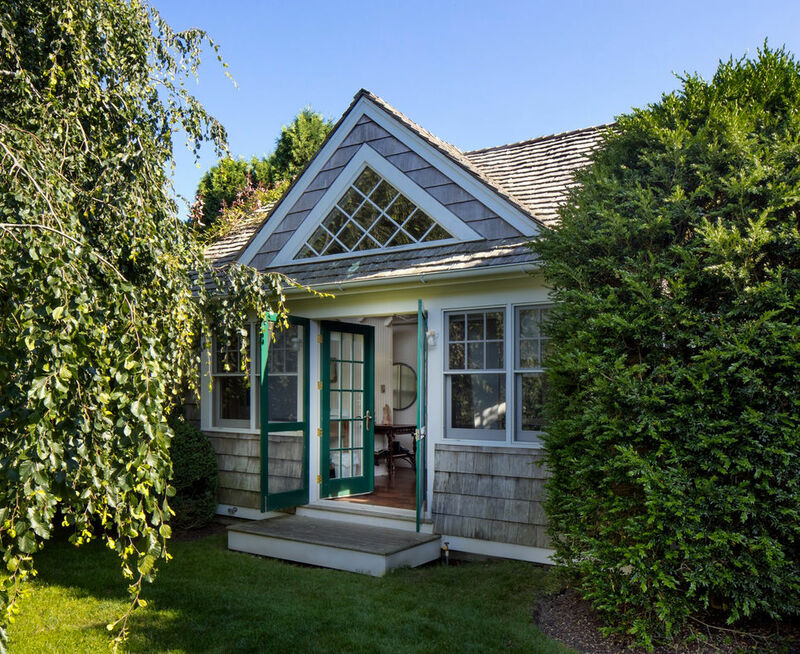 The historic East Hampton home dates from 1885 when the wealthy businessman bought the 18th century Jeremiah Miller house — one of the town’s old plots — and added a replica windmill. 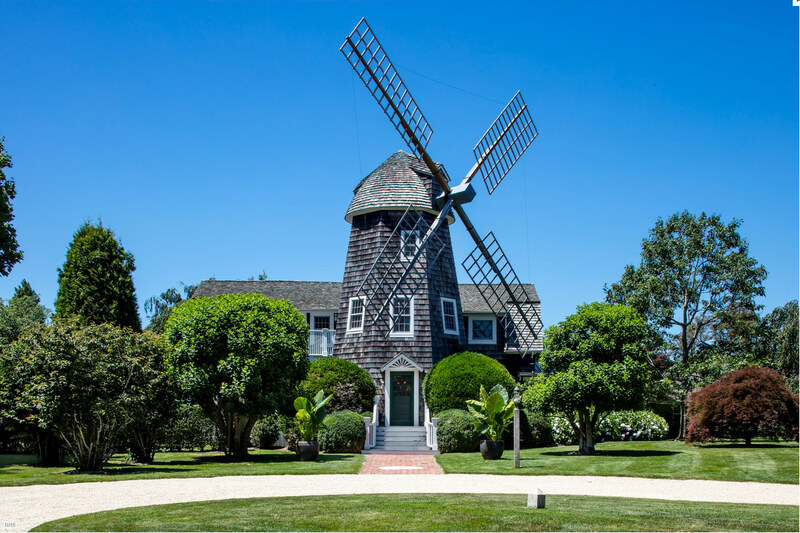 But instead of building it as a folly, or eccentric garden outbuilding, the windmill became part of this shingled home in the town’s historic district at a time when structures like faux windmills were in vogue. 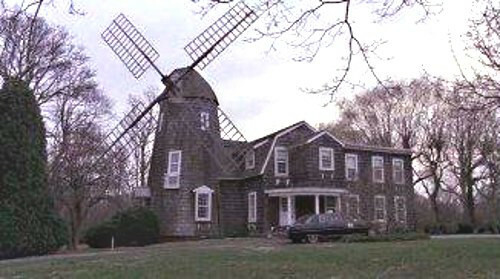 Cachet accrued when the DeRose Windmill Cottage became a movie house, used as a set for the 1982 Sidney Lumet mystery “Deathtrap” starring Michael Caine. A photograph from that time shows a more modest structure than the $11+ million, 3.5 acre property with 7 bedrooms and six bathrooms that’s been on and off the market at various times during the past decade and is currently for sale. I suspect the Windmill cottage is more appealing outside than inside, at least right now. The grounds are professionally landscaped and well established. 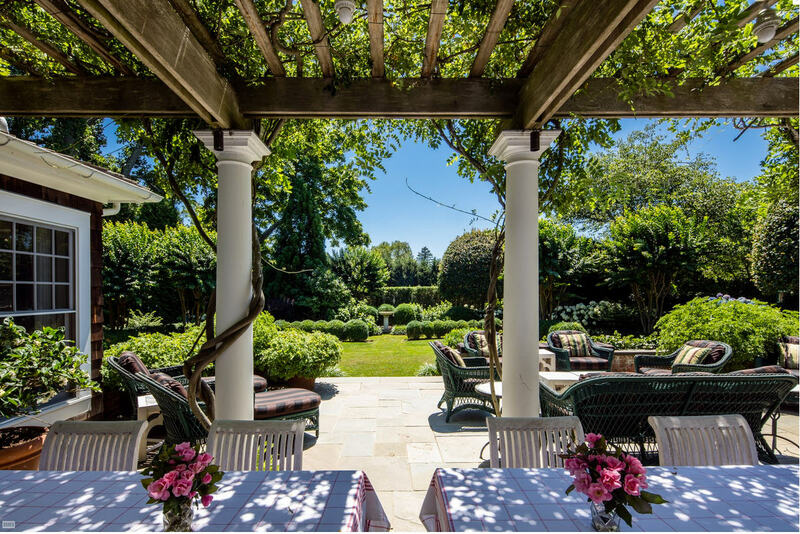 A covered outdoor porch has a vine-covered pergola supported by classical columns. 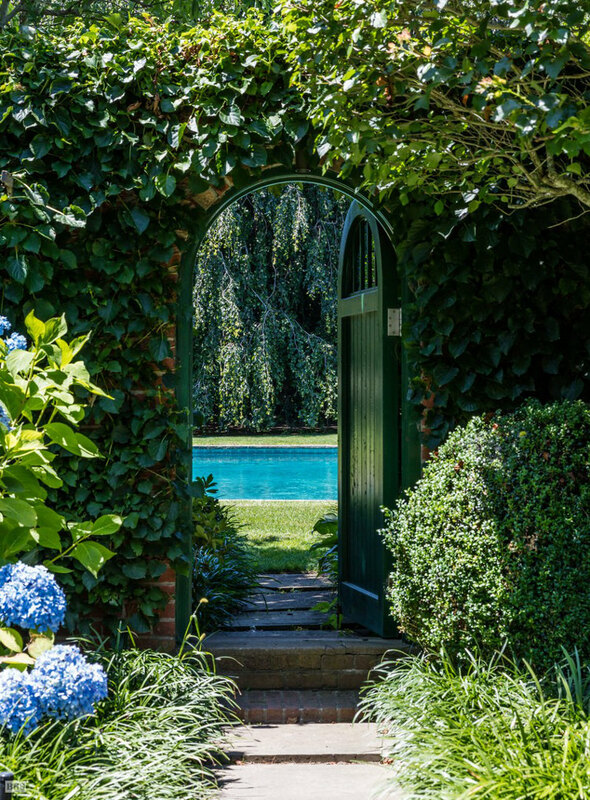 The entrance to the 50-foot pool has a “secret garden” gate embedded in a vine-covered brick wall. 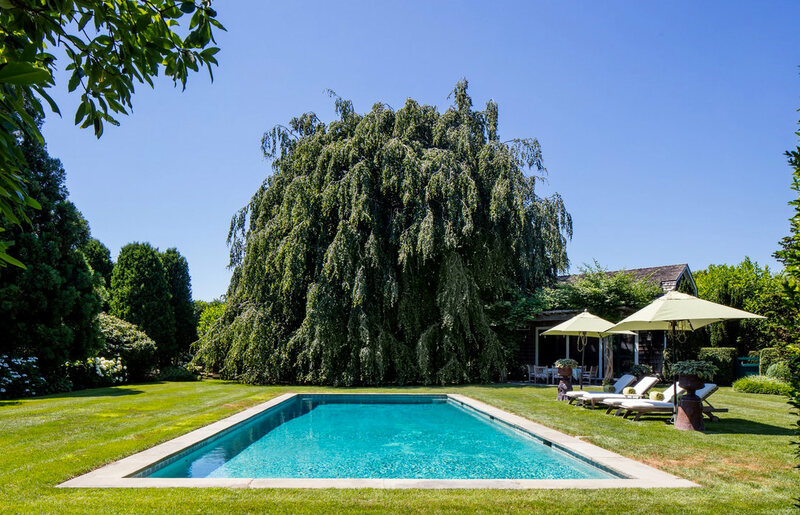 How gorgeous is this pool, which lines up with a majestic ancient tree on a separate 1.4 acre section of the property. As part of the separate parcel is this air-conditioned two-bedroom guest house and studio. Back in 1998 there was a renovation and addition to the house including the new kitchen, dining room mudroom and maid’s quarters, bringing the square footage to 8,500. The house also has a three-car garage, tennis court, and a potting shed. For me, the interiors would require several million dollars to match the quality of the grounds and outdoor features. 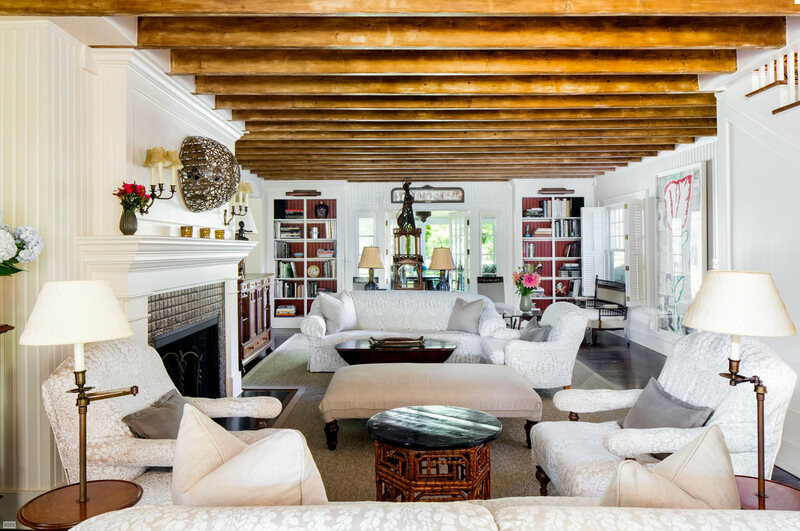 The living room boasts one of the home’s two fireplaces along with a handsome wood beam ceiling. With the right furniture, it could be stunning. Painting the cabinets and changing the table and chairs could go a long way towards upgrading the kitchen, which has good basics but looks dated. 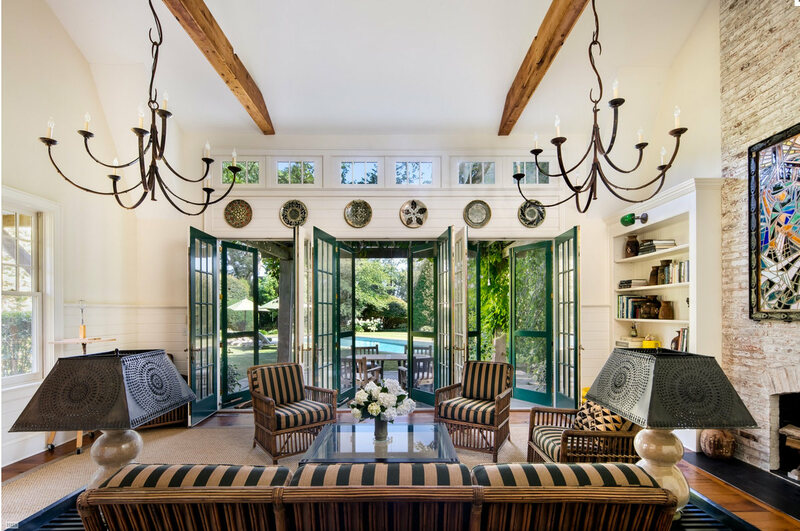 Airy proportions but unfortunate furniture characterize a lovely sunroom. 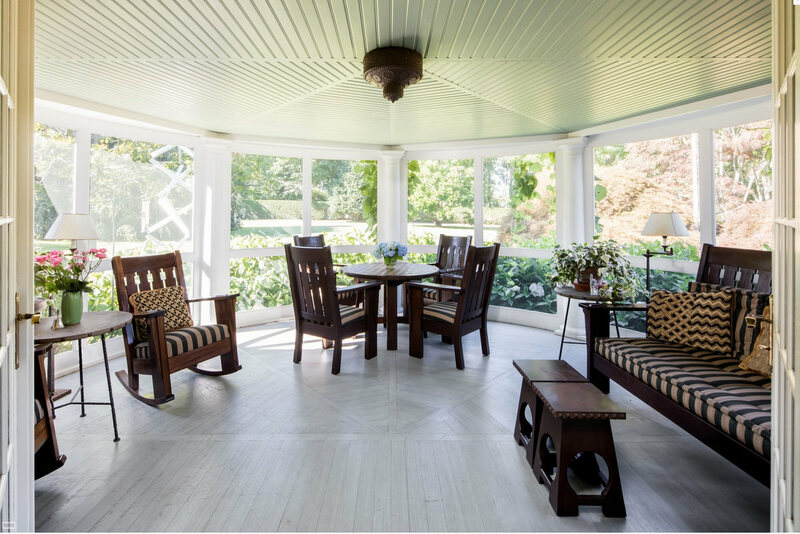 The semi-circular screen porch on the side of the house has a view of the lawn marred only by the staging. 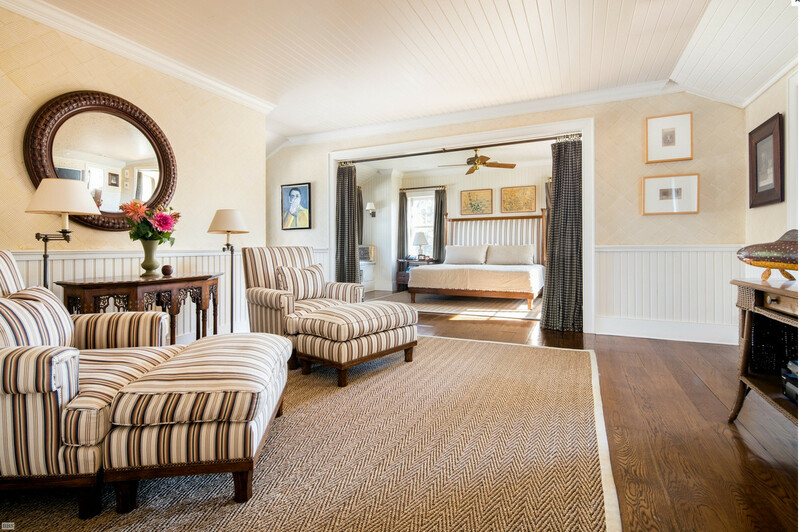 Upstairs, the master suite is composed of the bedroom and an adjacent sitting room that also can be screened off. 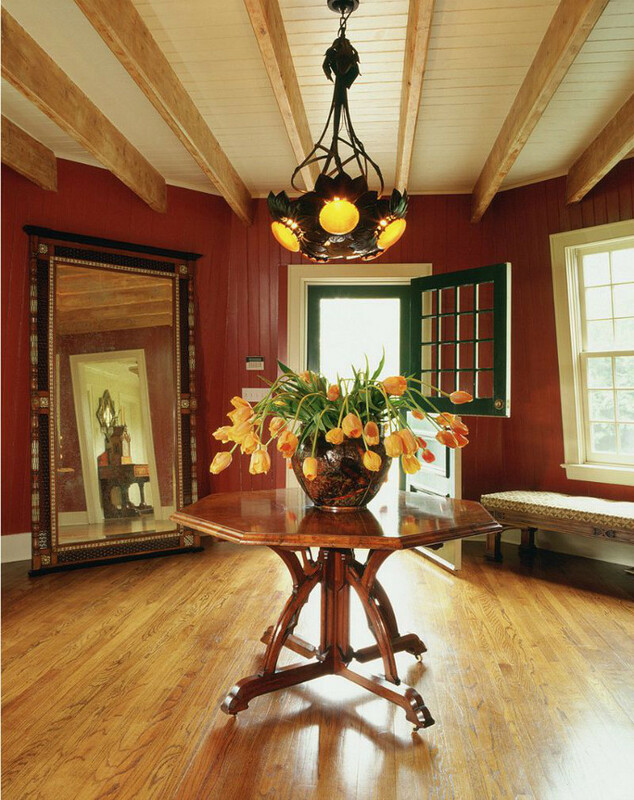 Office space and a library are located in the octagonal windmill tower — the entry has a wonderful antique chandelier, beams and paneling. 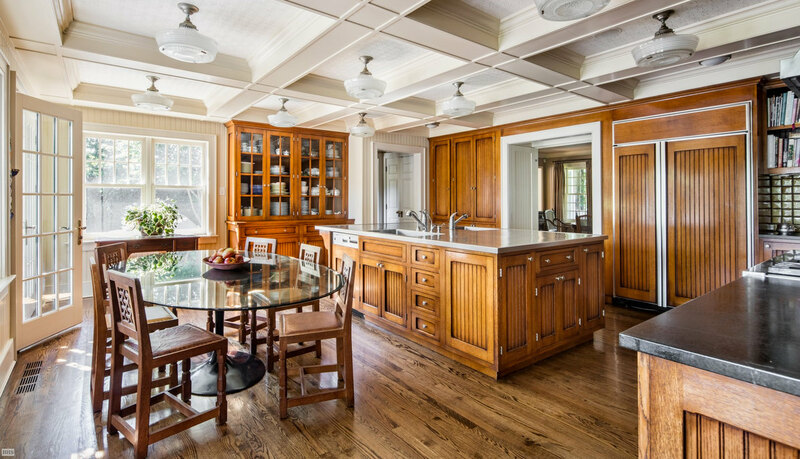 Owning a historic home with the proportions of this one is a privilege and a responsibility. The upkeep of the grounds alone is daunting. It has the space to be a fairy tale family house along with the pedigree and location to warrant an investment. But this is a house in search of an owner — perhaps a hedge-fund manager who can afford to do it justice. Meanwhile, it’s fun to look and lurk.